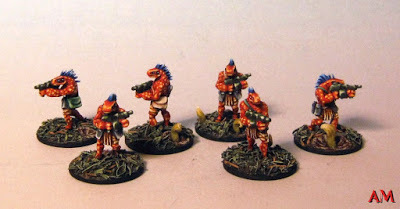 Allison M over at the Painting Agency Blog is a real fan of 15mm.co.uk and notably the Loud Ninja Games range of miniatures you can find there among many other things. Check out the original blog post HERE and visit this page HERE for the Ikwen. The post on the painting agency blog concerns a guerilla action carried out by the native Ikwen against Human invaders. A great little story which would sit well for a campaign using any 15mm sci-fi rules such as USEME or Alien Squad Leader with the Ikwen and perhaps the Rim Mercenaries from the HOF range standing in for the greedy Humans. Or... was I ripping off "Pocahontas"? !